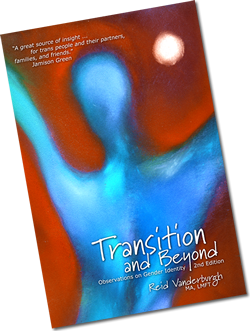 Transition & Beyond: Observations on Gender Identity | Reid Vanderburgh, MA., LMFT. This book, now in its second printing, has already been widely accepted among trans people and their families. Written in an easy-to-read style, it addresses many issues faced by trans individuals, their spouses/mates, and family members. The book also provides a point of reference for therapists with transitioning clients. ~ Katherine (Kit) Rachlin, Ph.D.
ORDER your copy of “Transition and Beyond: Observations on Gender Identity, Second Edition” by Reid Vanderburgh, MA, LMFT. $38.95 plus $5.00 Shipping & Handling in the contiguous US.